It's just water. But to the millions of Hindus expected at the Kumbh Mela festival, held this year along the Godavari, touching that water is reverential. It's a way to cleanse themselves of sin, to come close to God, to immerse themselves in a tradition that dates to antiquity. They have come to this city from across India and around the world. Entire villages arrive together, and their parties often last through the nights. Thousands of mystics gather. Water is central to many religions: Christians perform baptisms, Orthodox Jews seek ritual purity in mikvah baths, Muslims wash themselves before prayer. Believers in both Catholicism and voodoo find solace in the waters of Haiti's Saut d'Eau waterfall. Observant Hindus believe that four drops of holy nectar were spilled long ago during a battle between gods and demons. 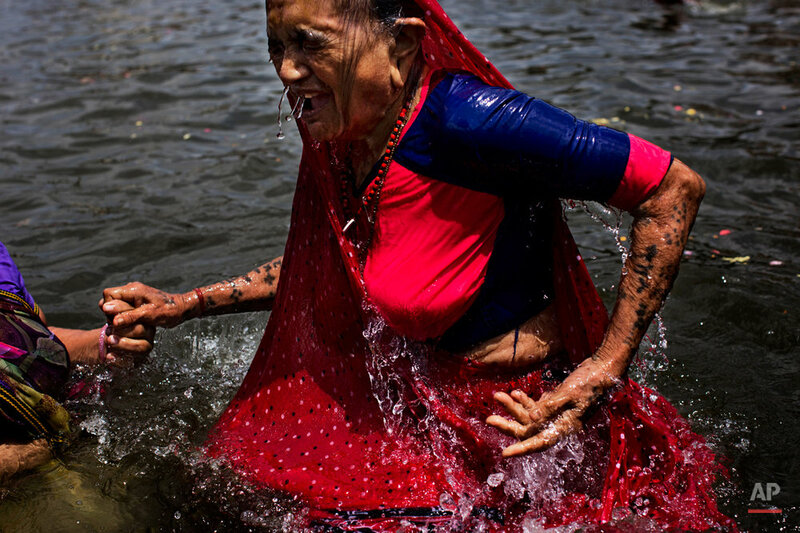 Since then, the Kumbh Mela has alternated between the four cities where the nectar fell. This year, the two-month festival is being held in the crowded city of Nasik. The moment when people immerse themselves is the culmination of all the travel and effort and prayer, and the dark water of the Godavari sparkles from the splash. Some people thrust themselves almost violently in and out of the water. Some go delicately. Some take a gentle swim. Authorities are testing the water for pathogens every few hours, and insist contaminants are at "safe levels." 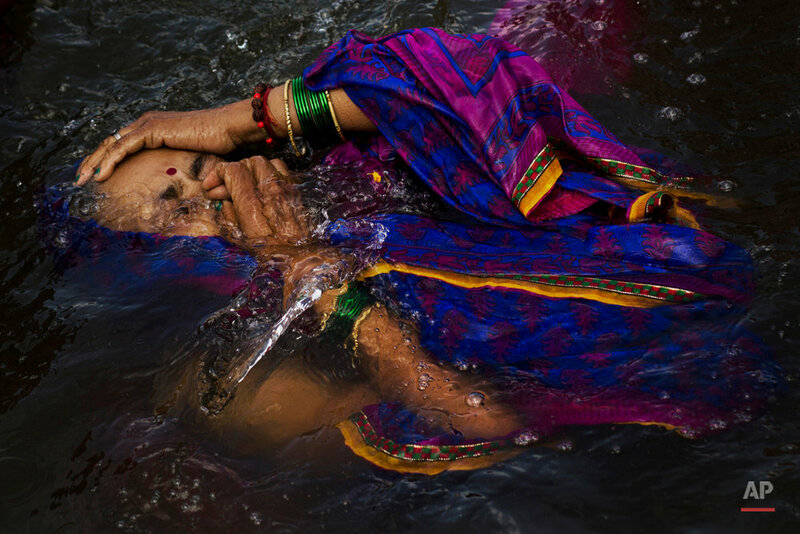 Many rivers across India have become foul with the country's economic development, with city sewage, farming pesticides and industrial effluents freely flowing into waterways despite laws against polluting. 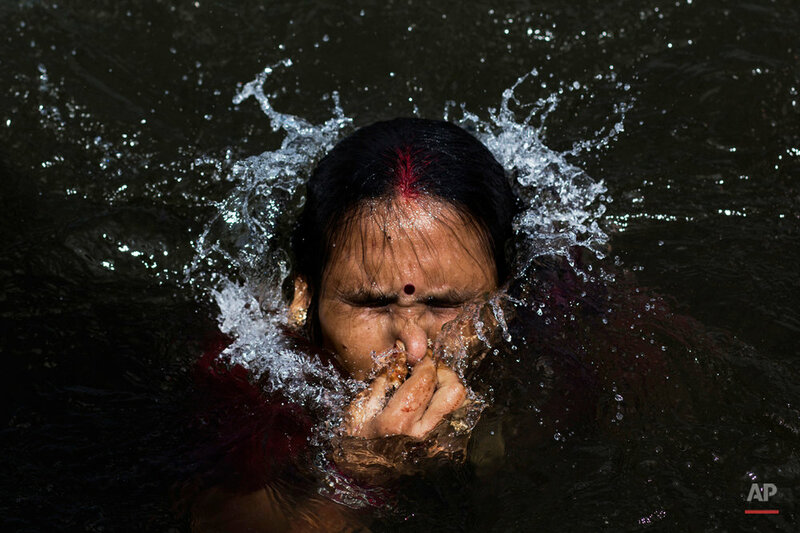 Text from the AP news story, India's river waters cleanse spirits at Hindu festival, by Bernat Armangué.